Melville is hitting the road, Oregon! Hey amigos and amigas. Melville is about to head out next week on a little run of dates and we could use your support in making us look/feel WAY cooler by placing your stamp of approval on us via an official Facebook ‘like’. (I know, it might seem silly, but ’tis the currency that bands trade in these days and it’d help us out a ton…). So officially stamp your virtual approval and share our Facebook page with your mom, your garbage man, your barista, your estranged 2nd cousin or whoever you think might enjoy what we do. We appreciate it greatly. 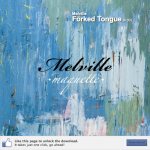 Oh, and you’ll also be able to grab a FREE DOWNLOAD of our new single, “Forked Tongue”! Thanks for your attention!